TheCoplandRoad.org: All the Best, Sandy. This weekend the beautiful game of football was once again put into perspective with the saddening news that Rangers’ legend Sandy Jardine is battling cancer. In the dark times that have encompassed our Club in recent months he has stepped forward and played his part in our revival which now sees us firmly on the road to recovery. Alongside Ally McCoist, he fought as hard as anyone to keep Rangers Football Club alive and for that we should be forever grateful. 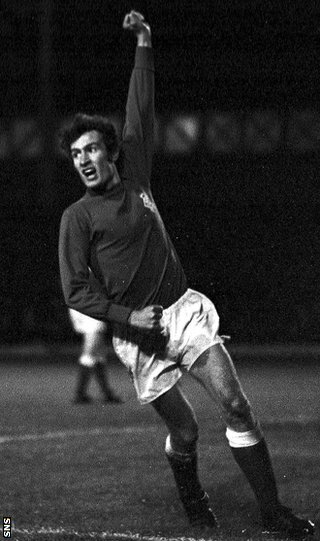 Sandy Jardine was born in Edinburgh on 31 December 1948 and made his Rangers’ debut when only eighteen years old. He went on to make a tremendous number of appearances for the Club and to win 38 international caps for Scotland. Many of us at the CRO are too young to remember his playing career, but we've seen the footage and we're sure we could do with a few more players of his quality nowadays. Sandy has since worked for Rangers FC in a public relations capacity, also assisting where necessary in the sales and marketing department. He was of course influential in the Rangers Fans’ Fighting Fund and the protest at Hampden which saw thousands of fellow Bears follow his lead and make a stance against the football authorities and their actions and for that he deserves recognition. The word 'legend' is too carelessly tossed around nowadays but Sandy epitomises everything that the word should stand for and represent. He dedicated his best years of service to Rangers as a player and continued to serve the club through his behind-the-scenes role in recent years. He rightly sits alongside fellow greats in the Greatest Ever Rangers Team and that too is evidence of his contribution to our great institution. We're sure you will all join us in wishing him all the best in his fight with cancer. Sandy won nearly every battle in his career. No doubt he can win this one too.